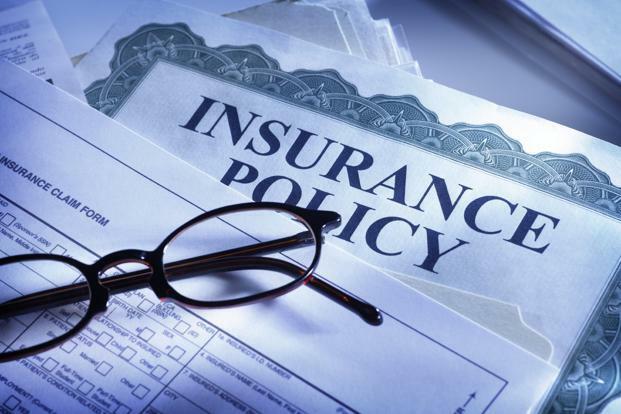 Premiums up 7.7% after falling for 5 years: Report - Corporate Risks India Insurance Brokers Pvt. Ltd. The global economy is expected to strengthen next year. The US and the UK are currently growing at a moderate pace of close to 2.5%, and real gross domestic product (GDP) in Japan and the Eurozone at a more subdued 0.7% and 1.5%, respectively. The four economies are all expected to see slightly better growth in 2016. Emerging markets will grow by about 5% annually in the next two years, according to a report by global reinsurer Swiss Re, named Global insurance review 2015 and outlook 2016/17. The global economy faces three main headwinds: slower growth in China, lower commodity prices and an imminent rate increase by the US Federal Reserve. The headwinds pose a risk to the baseline forecast, but are unlikely to derail the improving growth momentum. Among emerging markets, business and consumer sentiment in India have improved significantly on expectations of a strong push towards economic reform and liberalisation. Non-life insurance premiums grew by 7.9%, up from 2.7% in 2014, due to a stronger economy. 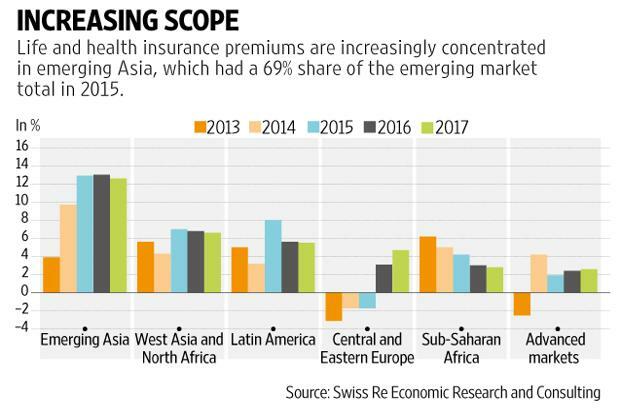 Life and health insurance premiums are increasingly concentrated in emerging Asia, which had a 69% share of the emerging market total in 2015. Growth was strong in India as well, with an acceleration due to a revival of unit-linked insurance products and improved performance in bancassurance. India is expected to contribute to a healthy growth of non-life premium in emerging Asia in the coming two years. In fact, demand for primary non-life insurance should increase globally in the next two years given the improving economic outlook. The emerging markets will be the main drivers, with an expected recovery in Central and Eastern Europe and incremental growth improvement in other regions. Non-life real premium growth in emerging markets is expected to improve in 2016 and 2017, rising by 7.9% and 8.7%, respectively, after a 5.6%-gain in 2015. Emerging Asia will see the strongest annual growth of 12% in 2016 and 2017, and Latin America the weakest (1% and 2.5%, respectively). Urbanisation and growing wealth will support overall insurance sector growth in the emerging markets. Life and health premiums are projected to see stable and robust growth of nearly 11% in the next two years. Again, emerging Asia will have the most robust growth of about 13%. In the advanced markets, real premium income growth is estimated to have slowed to 1.9% in 2015 from 4.2% in 2014. The slowdown would have been more pronounced if not for the overall benign inflation rate environment, driven by the sharp decline in energy prices. Growth decelerated or continued to decline in most continental European markets, and premiums grew at a slower pace in Canada and Japan. In the US and the UK, premium income returned to growth in 2015. In emerging markets, premium income rose by an estimated 10.6% in 2015 after a 7.4%-gain in 2014. Growth was strongest in the emerging Asian countries (up 13.2%). In China, premiums were up 12% and in India by 7.7%, the latter after five years of contraction and stagnation primarily due to regulatory changes. In India, there was an important development in March with the passing of the Insurance Laws (Amendment) Bill, which raised the foreign direct investment (FDI) ceiling in Indian insurers to 49% from 26% and allowed foreign reinsurers to establish branch offices in India. These are expected to significantly facilitate foreign participation. India is the sixth largest liability market in Asia with estimated premiums of $254 million in the year 2014. But the market is still underdeveloped, with penetration of just 0.01% of GDP. Underwriting profits, though, have remained strong. Rates in liability have been stable over the past couple of years with the exception of medical malpractice, where they increased by 10-20% in 2014. General liability is the biggest line of business currently. Recent trends suggest that after the enactment of a new Companies Act in 2013, there has been an uptick in corporate interest in directors and officers liability cover. More engineering, pharmaceuticals and automotive companies are buying product liability insurance. Demand for professional indemnity is also increasing. On-ground practices by insurers has improved with many choosing to use mobile data and mobile technology to track potential claims, identify policyholders, reduce graft, speed up claim verification and processing, and lower the cost and headcount required for processing claims. There is much scope in India for life insurance as well. India has the second largest mortality protection gap in absolute terms, at $8.6 trillion. Mortality protection gap is the difference in actual protection, compared to the protection needed to sustain a household at its same living standard after the death of a breadwinner. The aggregate mortality protection gap in 13 Asia-Pacific markets widened to $58 trillion in 2014 from $42 trillion in 2010. The downside risks to global growth are currently balanced, with some bias to the downside. Last year, the Euro area was a main concern but in 2015, China and the emerging markets are more worrisome. The upside risk, still 10%, is not as large in growth terms as the downside risk, particularly in the Euro area and emerging markets. The possibility of a major regional downturn is also 10%, but it lowers growth by more than the upside lifts growth. Prospects for the US housing market have improved and the Eurozone is on surer footing, but China and commodity-exporting countries are hurting. Japan’s prospects have not changed. In the downside scenario, yields on government bonds would stay near current levels through to mid-2016 and perhaps longer, while equity markets would decline and credit spreads would widen. In the upside scenario, US housing starts would reach some 1.5 million units in 2016, up from about 1.1 million this year. Consumers remain confident, so vehicle sales would top 18 million, up from about 17 million in 2015. In Europe, the UK economy would grow by more than 3%, based on domestic demand, and Spain by over 4%. Italy’s recovery would gather steam on the back of the Prime Minister’s reforms and Germany would also begin more economic reforms, boosting business confidence and investment. Finally, China’s policymakers would seek to put growth on a more sustainable path by reforming state-owned enterprises. Under the baseline upside scenario, insurance premium growth will be close to GDP growth in the advanced economies and generally higher than GDP growth in the emerging markets, which will benefit from increased insurance penetration. In the downside scenario, there is greater stress from lower premium growth and pressure on asset valuations. The upside scenario would be more favourable for the re/insurance industry. Investment yields would improve and premium volumes would rise along with economic activity.